Following the success of Hillsborough’s Teen Zombie Night I have been asked to bring my book and presentation on zombie folklore and survival to the Warren Township Library. I’m looking forward to sharing zombies with a fresh group of bodies…or should that be the other way around? 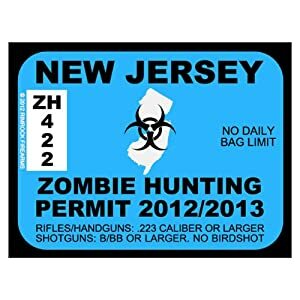 Anyway, if the NJ libraries keep up with these Zombie Nights I have no doubt that the great Garden State will survive the undead apocalypse! A huge thank you to Diane from the Hillsborough library and everyone who came out for the Hillsborough Zombie Night, especially those that braved a freak hail/thunderstorm in full zombie make-up! I was impressed!